Your generous sponsorship gift of $3000 will entitle you to a reserved table (12 seats) at the breakfast event and a full-page ad to display your company name and logo in the Souvenir Book. In addition, your participation will be acknowledged during the Breakfast program. As a Gold sponsor, your contribution of $2000 will entitle you to 6 complimentary seats at the breakfast event and a half page ad to display your company name in the Souvenir Book. As a Silver sponsor, your contribution of $1500 will entitle you to 3 complimentary seats at the breakfast event and a quarter page ad to display your company name in the Souvenir Book. 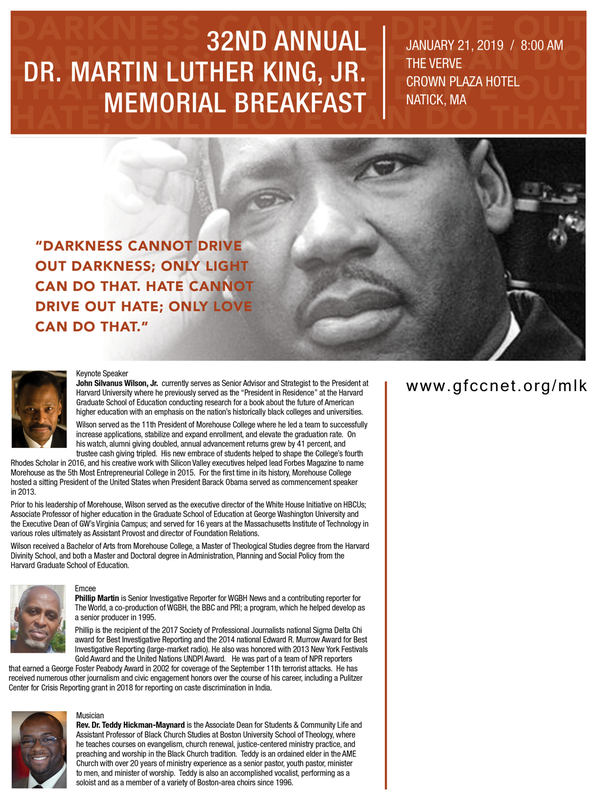 Your contribution of $500 will enable ten youth from the Metro West community to attend the Breakfast. A contribution of $50 will entitle you to acknowledgement in the Souvenir Book.